We develop new methods for probabilistic modeling, Bayesian inference and machine learning. Our current focuses are in particular learning from multiple data sources, Bayesian model assessment and selection, approximate inference and information visualization. Our primary application areas are digital health and biology, neuroscience and user interaction. Finnish Center for Artificial Intelligence (FCAI). Postdoc Måns Magnusson receives the Cramér prize for the best thesis in Statistics, defended in Sweden 2018. Congratulations, Måns! Saïd Maanan joins the PML group as a postdoctoral researcher. He received his PhD in Statistics from the University of Auckland, and has 3+ years of experience in Information theory, Convex optimization, Graphical models, Multivariate analysis, and Latent-variable modeling. Saïd will be applying new simulation-based inference methods, in particular Approximate Bayesian Computation set of procedures, to develop a new generation of AI methodology. Welcome, Saïd! Associate Professor Richard Everitt from the University of Reading will give a guest lecture titled: "ABC and synthetic likelihood for expensive simulators" on Tuesday 19 March at 10:15 in T5 (A133), CS department, Aalto University. Welcome! Finnish Center for Artificial Intelligence (FCAI) is looking for a software developer to work on an exciting collaboration on new AI methods. Find out more and apply here by the deadline of 25.3.2019. Finnish Center for Artificial Intelligence (FCAI) is looking for a manager to coordinate and manage its administration. Find out more and apply here by the deadline of 28.2.2019. M.Sc. (Tech) Jarno Lintusaari will defend his doctoral dissertation "Steps forward in approximate computational inference" on Monday 18 March 2019 at 12 noon at the Aalto University School of Science, lecture hall H304, Otakaari 1, Espoo. Opponent: Associate Professor Richard Everitt, University of Reading, UK. Custos: Professor Samuel Kaski, Aalto University School of Science, Department of Computer Science. Alina Saaranto joins the PML group as a Master thesis worker. She will be working on with B2B marketing problem from the buyer's perspective using agent-based modelling (ABM). We are looking for summer interns! Apply by 31.1.2019 here (national call) or here (international call). The Finnish Center for Artificial Intelligence (FCAI) has been granted over €8 million in funding from the flagship programme of the Academy of Finland. Find out more here. Ivan Yashchuk joins the PML group as PhD student. Welcome! Positions for Exceptional Doctoral Students in the PML group. Find out more here and apply by 31.1.2019. Aalto University School of Science invites applications for tenure-track or tenured professors in Computer Science. Find out more and apply here by 10.1.2019. Professor Barbara Engelhardt from the Princeton University will give a guest talk on Thursday 13.12.2018 at 15.00 in lecture room T2,CS department, Aalto University. Antti Kangasrääsiö defended his doctoral dissertation "Machine Learning Methods for Interactive Search Interfaces and Cognitive Models" today. Congratulations D.Sc. Antti Kangasrääsiö! Dissertation available here. Professor Kristian Kersting from the Technical University Darmstadt will give a guest lecture titled: "The Automatic Deep Statistician" on Thursday 15.11. at 17:15 in T5 (A133), CS department, Aalto University. AI Day 2018, organized at Aalto University by the Finnish Center for Artificial Intelligence, brings together researchers, companies, students and the public sector involved in the fast-developing field of AI. The event promotes matchmaking, information sharing and cross-border collaboration. Register for the event here. Open positions for postdocs and research fellows in machine learning and AI. Come and join us! Please see the full ad here. The latest Aalto Magazine issue focuses on artificial intelligence and features an interview from Sami Kaski. See more here. Mohammad Moein joins the PML group as PhD student. His main research is to aid drug discovery process by using statistical learning and optimization approaches. 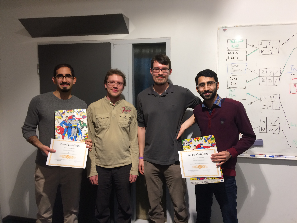 Mohammad completed his MSc in Computer Science from Technical University of Munich where he worked on different computer vision problems during his master study and wrote a thesis in the context of robust spectral clustering. Welcome, Mohammad! Zeinab Rezaei Yousefi joins the group as a PhD student after having worked with us as a summer intern. She will be working on interactive intent modelling. Zeinab completed her MSc at Tampere University of Science in Biomedical Engineering. During her master thesis she worked on signal quality estimation of Photoplethysmography (PPG) pulses acquired from PulseOn optical heart rate monitor and developed a classifier based on artificial neural networks. Welcome, Zeinab! Samuel Kaski featured in an article by the Academy of Finland: "Samuel Kaski teaches machines to learn". See the full article here . The Future Makers program of the Technology Industries of Finland Centennial Foundation and the Jane and Aatos Erkko Foundation awards 1M€ to FCAI (Finnish Center for Artificial Intelligence) initiative in which we are building an AI software toolbox to enable companies to have a smoother transition into using artificial intelligence methods. See more here (in Finnish) and here (in English). M.Sc. (Tech) Antti Kangasrääsiö will defend his doctoral dissertation "Machine Learning Methods for Interactive Search Interfaces and Cognitive Models" on Friday 16 November 2018 at 12.00 at the Aalto University School of Science, Lecture hall M1 (2nd floor, M-wing), Otakaari 1, Espoo. Dissertation available here. M.Sc. (Tech) Eemeli Leppäaho will defend the dissertation "Bayesian Multi-View Factor Models for Drug Response and Brain Imaging Studiesâ€� on Friday 12 October 2018 at 12 noon at the Aalto University School of Science, lecture hall F239a, Otakaari 3, Espoo. In the dissertation, modelling of multiple related data sources was studied. Applications to drug response and brain imaging studies showed the advantages of the developed methods. Dissertation available here. Jaakko Peltonen appointed as professor of statistics (data analysis) at the University of Tampere as of 1.6.2018. Congratulations! Pekka Marttinen and Arno Solin appointed as an assistant professors in machine learning at Aalto University as of 1.8.2018. Congratulations! Open Postdoc and Doctoral student positions in machine learning available. More information here. Luana Micallef appointed as an assistant professor of Information Visualization at the University of Copenhagen as of 1.8.2018. Congratulations! Pekka Parviainen to join the University of Bergen as an associate professor as of 1.6.2018. Congratulations! Yang Zhirong appointed as a professor at the Norwegian University of Science and Technology (NTNU). Congratulations! EXCAPE - using supercomputers and machine learning for drug discovery. New course in Aalto on Probabilistic Modelling for Cognition and Interaction: Towards AI That Understands Its User will begin on February 19th. Michael Betancourt (Columbia University) is visiting the group and gives a talk "Here Be Dragons: High-Dimensional Spaces and Statistical Computation" in the Machine Learning coffee seminar on Monday 12.2. 9:15 in lecture hall T5. New AI method keeps data private. Apply for Macadamia Doctoral Track (Machine Learning, Data Science and Artificial Intelligence). Positions for Exceptional Doctoral Students in the PML group. More info here. Aalto University and the University of Helsinki have joined forces in artificial intelligence research by establishing the Finnish Center for Artificial Intelligence (FCAI). More information here. Finnish Academy of Science and Letters (Suomalainen Tiedeakatemia) has granted Homayun Afrabandpey a funding for a full year. Congratulations! Dr. Anil Korkut (Dept. Bioinformatics & Comp Bio UT MD Anderson Cancer Center) gives a talk "Overcoming resistance to targeted cancer therapy with network pharmacology" in lecture hall T5 on Friday 28.7. at 10:15 (coffee at 10:00). The lecture is open to everyone free-of-charge. More information here. Muhammad Ammad-ud-din, M.Sc. (Tech. ), will defend the dissertation "Machine learning methods for improving drug response prediction in cancer" on 27 July 2017 at 12 noon in Aalto University School of Science, lecture hall T2, Konemiehentie 2, Espoo. More information here. Good luck! Several postdoctoral researcher positions available (deadline Sept 24). More information here. Makoto Yamada from RIKEN AIP is visiting us 22.-31.5. Zhirong Yang gets an Academy Research Fellow position. Congrats! ICML 2017 Workshop on Private and Secure Machine Learning. Submission deadline is 26 May. Computers learn to understand humans better by modelling them. News item here. New software package for exploratory analysis of multiple data sources published! New algorithm identifies gene transfers between different bacterial species. More information here. Professor Motoki Shiga (Gifu University, Japan) is visiting the group 27.2 - 3.3 and gives a talk Electron Microscopic Spectral Imaging Analysis Based on Nonnegative Matrix Factorization in lecture hall T4 on Thursday 2.3. at 12:15. More information here. Several Postdoctoral Researcher and Research Fellow Positions available (deadline March 19). More information here. Fully funded positions for exceptional Doctoral students (deadline March 5). More information here. Finland wants to be world's number one in AI. Apply for summer intership in PML group, deadline Feb 7. The list of topics can be found here. ELFI: Engine for Likelihood-Free Inference facilitates more effective simulation. See the news item here. A new mutation mechanism was found in human and bacterial genomes. See the news item here. Machine Learning Coffee Seminars starting January 9. More information here. AScI internship opportunities available for Bachelor's students. More information here. Doctoral track takes Bachelor's students directly into PhD studies. More information here. John O'Donovan (University of California Santa Barbara) is visiting us on Wednesday 14.12. and will give a talk Interaction Design and Evaluation for Recommender Systems in T2 at 11:15. New Python software Engine for likelihood-free inference (ELFI) released! See the code at GitHub. Information retrieval is now possible with the help of EEG interpreted with machine learning. More information here. 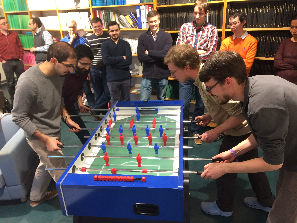 PML group ruled in the first CS department Foosball tournament organized this autumn! The final was played between teams Eemeli Leppäaho & Jussi Gillberg and Pedram Daee & Homayun Afrabandpey, the victory going to Pedram and Homayun. Congratulations! Here are two pictures from the final: the battle and the ceremony. Thomas Brouwer (Univ Cambridge) is visiting us 7. - 11.11. and gives a talk on Bayesian data integration by multiple matrix tri-factorisation (7.11. at 12:15 in T6). The abstract of the talk can be found here. Henri Vuollekoski and Teppo Niinimäki joined the group as postdocs. Betül Güvenç joined the group as a doctoral student. Welcome! Abhirup Datta's visit is cancelled due to delays in flights. Thus the talk originally scheduled for tomorrow is also cancelled. Abhirup Datta from Johns Hopkins University will visit the group on Wednesday 31.8. and gives a talk about Hierarchical Nearest-Neighbor Gaussian Process Models for Large Geostatistical Datasets (arXiv) in room T4 at 3pm. Digital calculator provides the estimated risk for GIST recurrence based on a risk analysis model developed by Aki Vehtari. See the news item here. 2016 DeGroot Prize was awarded to Aki Vehtari and co-authors for the book Bayesian Data Analysis. Congratulations! See the news item here. GPstuff 4.7 has been released and can be downloaded here. Javier González from University of Sheffield is visiting the group 8.6. - 10.6. Our group was involved in organizing the ABCruise workshop on Approximate Bayesian Computation and related methods. More information can be found from the corresponding HIIT news article. Olli-Pekka Koistinen came in 13th in the European Orienteering Championship Sprint in Czech Rebublic. Congratulations! Alan Saul from University of Sheffield is visiting the group 23.5. - 11.6. Thomas Brouwer from University of Cambridge is visiting the group 11. - 13.5. He will give a talk Bayesian data integration by multiple matrix tri-factorisation on Thursday 12.5. at 13:00 in T4 (room A328). Arno Solin will defend his dissertation Stochastic Differential Equation Methods for Spatio-Temporal Gaussian Process Regression on Friday 8.4. at 12:15 in F239a (Otakaari 3). Good luck! Prof. Manfred Opper from TU Berlin will give a talk Score matching and nonparametric estimators of drift functions for stochastic differential equations on Thursday 7.4. at 15:15 in lecture room TUAS R037/1023-1024. Apply for Postdoctoral and Research Fellow positions in PML group. Juho Kokkala will defend his dissertation Particle and Sigma-Point Methods for State and Parameter Estimation in Nonlinear Dynamic Systems. Good luck! Apply for Summer Traineeship in PML group. PhD positions available in PML group. Application deadline is February 29. PML group is offering Master's Thesis work positions. Qin Xiangju joins the group as a postdoc. Welcome! Apply for AScI internship in PML group. Prof. Ole Winther from Technical University of Denmark (DTU) is visiting the group 18. - 20.1. He will give a talk FindZebra - the search engine for rare diseases on Wednesday 20.1 at 15:30 at lecture hall TU1. Eero Siivola joins the group as a doctoral student. Welcome! Marko Järvenpää joins the group as a doctoral student. Welcome! Alan Saul from University of Sheffield is visiting the group 2.11. - 2.12. PML group takes part in organizing the ABCruise. Iiris Routa joins the group as a doctoral student. Welcome! We have two new group members: Marta Soare joined the group as a postodc and Karoliina Toivonen as a research assistant. Welcome! Prof. Sara Mostafavi from University of British Columbia is visiting. She will give a talk Integrating multiple types of genomics data to disentangle meaningful associations on 8.9.2015 at 14:15 in lecture hall T2. Suleiman Khan will defend his dissertation Bayesian multi-view models for data-driven drug response analysis. Good luck! Prof. Florence d'Alche is visiting the group 1. - 2.9.2015. Jonathan Strahl joins the group as a doctoral studet. Welcome! Postdoc and research fellow positions in probabilistic machine learning, interaction and augmented research. More information here. Alan Saul from University of Sheffield is visiting the group 21.8. - 4.9. Andrej Gisbrecht joins the group as a postdoc. Welcome! Aalto Probabilistic Machine Learning group launched! The group is a fusion of two former research groups from Aalto University, the Statistical Machine Learning and Bioinformatics group and the Bayesian Methodology group. Xuran Zhao has been appointed to an assistant professorship at Zhejiang University of Technology. Congrats! The group has an open PhD position in machine learning and visual analytics. See the call for details and apply by June 17th! Samuel Kaski was selected as Academy Professor for the years 2016 - 2020. Congrats! Pekka Marttinen gets an Academy Research Fellow position. Congrats! We are co-organizing MASAMB 2015. The group has open postdoc positions. See the call for details and apply by April 26th! Tomi Peltola joins the group as a postdoc. Welcome! Homayun Afrabandpey joins the group as a doctoral student. Welcome! Assistant Professor Fan Yang from Xiamen University visits the group and gives an invited talk. We are hiring summer interns (Deadline passed). Pekka Marttinen becomes a university lecturer. Congrats! The group has open postdoc positions. See the call for details and apply by January 7th! Tommi Suvitaival will defend his doctoral thesis Bayesian Multi-Way Models for Data Translation in Computational Biology. Good luck, Tommi! FiDiPro Professor Hiroshi Mamitsuka joins the group. Welcome! Sahely Bhadra, Yi Chen (postdocs), Mrinal Kanti Das and Pedram Daee (doctoral students) join the group. Welcome! Paul Blomstedt joins the group as a postdoc. Welcome! Juuso Parkkinen will defend his doctoral thesis Probabilistic components of molecular interactions and drug responses. Good luck, Juuso! Seppo Virtanen will defend his doctoral thesis Bayesian latent variable models for learning dependencies between multiple data sources. Good luck, Seppo! S. Kaski will give a keynote at PRIB 2014, on Learning from multi-modal data: integration, data translation and drug sensitivity prediction. Ali Faisal will defend his doctoral thesis Retrieval of Gene Expression Measurements with Probabilistic Models. Good luck, Ali! The Finnish weekly news magazine Suomen Kuvalehti publishes a news article about the filter bubble and SciNet. The group is involved in a new Tekes strategic research opening (a participant in the living factories programme). Drug sensitivity predicted computationally by HIIT and FIMM researchers (Nature Biotechnology article; press release). Samuel Kaski gives a keynote talk in CIP2014, on Exploratory and Contextual Search with Interactive Intent Modelling. Luana Micallef joins the group as a postdoc, with joint appointment with UI. Welcome! Lu Cheng awarded the best Finnish 2013 PhD thesis in bioinformatics by the Finnish Society for Bioinformatics. Pekka Parviainen joins the group as a postdoc. Welcome!